In addition to the IEC 60945 maritime certification, the CEC Family from MPL has now received EN50155 certification for the use in railway applications. This innovative ultra compact computer product line is still based on the MPL typical product characteristics like; robustness, highest reliability, long term availability, low power consumption, as well as use in the extended temperature range. The heart of the CEC are the low power consumption ATOM CPUs from Intel. They are are from Intel's embedded program which guarantees a long-term availability for the CPU. MPL products are typically being offered for at least 10 years after its first introduction. 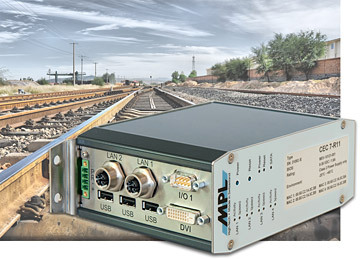 The solution comes without any cable connection and makes it ideal for for the use in rugged applications such as Railway, Maritime, Aerospace, or Defense. Even HDD or SSD are connected without the use of a connector cable. CECs are very universal as they come with 2 serial lines, up to 7 USB ports, PC/2 DVI, and up to 4 GigeE interfaces with M12 connectors. They can be expanded internally over a miniPCIe with WLAN, Fieldbus (Profibus, CAN, ...), or any other miniPCIe module. The input range is 9 -36 VDC and polarity protected. The unit can be wall mounted with a flange or via DIN-Rail mounting. Needless to say that the solution is available with optional bonding and coating.